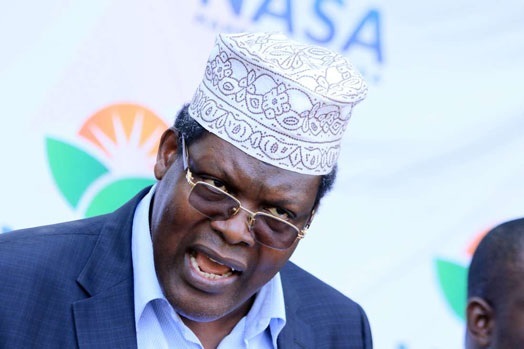 Sunday July 29, 2018 - Exiled National Resistance Movement (NRM) leader, Miguna Miguna, has hit out at Wiper Party leader, Kalonzo Musyoka, calling him a confused animal like a chipmunk. Venting on social media, Miguna described Kalonzo as a coward and somebody who does not deserve to be the President of Kenya. This comes after former Kalonzo’s Party resolved to work directly with President Uhuru Kenyatta following his handshake with Raila in which he was locked out. Speaking to the press yesterday, Wiper's National Executive Council (NEC) and Parliamentary Group which convened at the party's headquarters in Karen, Nairobi, confirmed that they will fully support Uhuru's leadership. “We strongly appreciate selfless leadership by Raila and Uhuru who chose to shelve their political interests and egos for the unity of Kenyans," read the statement by Wiper. However, Kalonzo’s statement has not gone down well with Miguna, prompting ‘the general’ to call him an irredeemable fool who is confused even on what he wants. “He is not just a coward who could not attend the January 30, 2018 swearing-in ceremony at Uhuru Park he is a conflicted, contorted and confused animal like a chipmunk," Miguna posted.